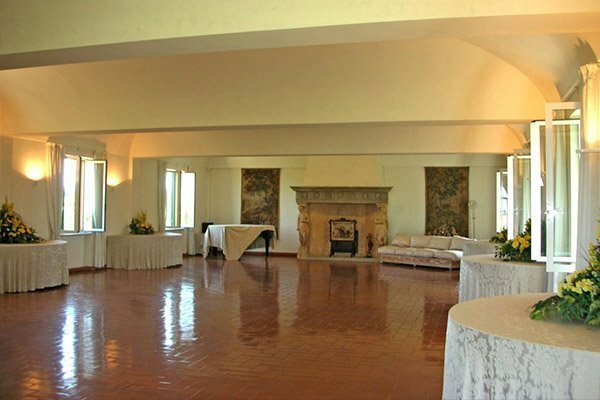 It is extremely rare to find in Piedmont, in the ancient Monferrato, an historic villa dating back to the eighteenth century villa, that preserves, as The Marchesa Estate, an intact lanscapes of 188 acres including the 150 acres of vineyards of Gavi, the great white Piemontese, Monferrato Rosso and Albarossa, the fruit garden, the Italian garden, the water garden with lotus flowers at the lake. A combination of great charm that recalls the most famous French chateaux in the care taken in hospitality, both for guided tours and for hospitality in the farm. 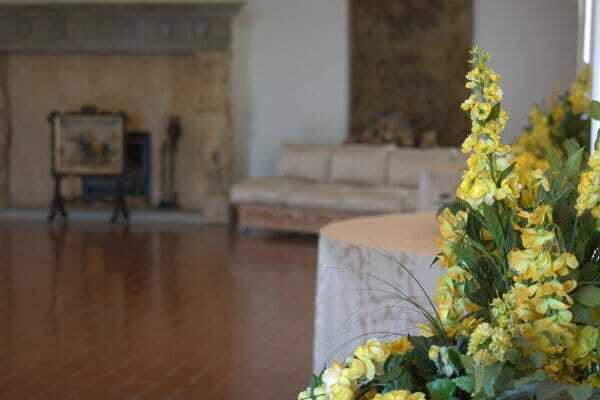 The Villa, a national monument, harmonizes perfectly with the structure of the cellar, with the farmhouse of the same era, the ancient well, the lemon house. All in compliance with the tradition of large farms of the past. The Marchesa Estate, the name with which from 1700 the estate is mentioned in pastoral visits and wills, recalls the great properties of the Genoese aristocracy, which were located in the ancient road that connected Genoa to Novi Ligure, the branch of the so called “Francigena street” that brought the pilgrims to embark in Genoa for the trip to Rome or even to Jerusalem. In Novi Ligure, the great Genoese bankers, like the Marquises Sauli, the ancient owners of The Estate, owned a palace in which they moved 4 times a year for the “Exchange Fairs”, real trade fairs for barter, in which the balances were settled in cash by bankers. 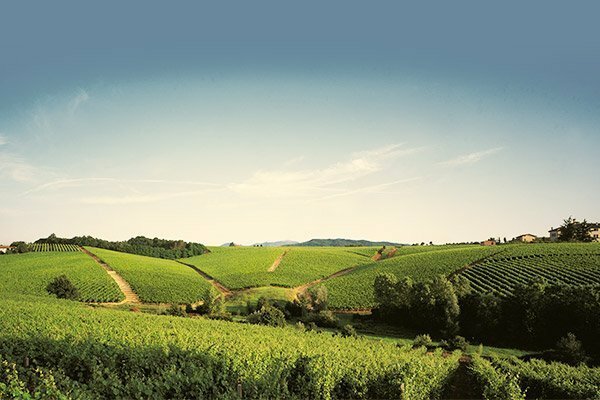 But Novi Ligure was also part of the Monferrato, the small state wedged between Piedmont, Liguria and Lombardy. A state “supersnob” so much to be called “the state of the two emperors”, as the first dynasty, the Alerami, was born in 900 AD from a marriage with the daughter of Emperor Otto and the following, the Paleologues, descended direct line from the emperors of Constantinople. At 500 meters from the farmhouse, the villa, historic house and national monument, also mentioned by Wikipedia as one of the particularly valuable destinations to visit in Novi Ligure, built in the second half of 1700, is a rare example of country architecture that has preserved the splendor of a large villa of the era. The villa of The Marchesa Estate remained absolutely intact, maintaining at the same time the agricultural purpose of the company of 76 hectares that surrounds it, remembered in ancient testaments as rich in vineyards, woods, meadows, without forgetting the silkworm for which Novi Ligure was so famous that the London Stock Exchange in the 1800s was based on silk prices in Novi Ligure. 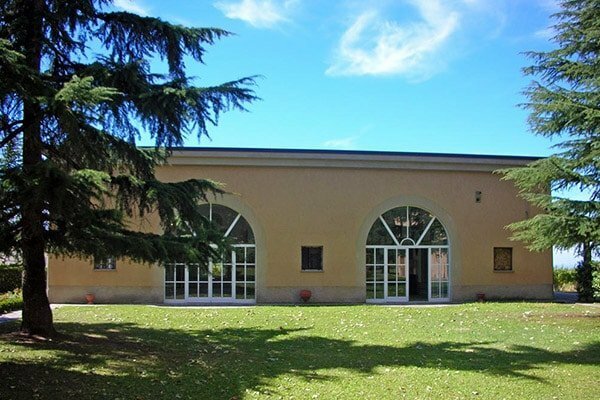 The Marchesa concert hall, of 200 square meters, is available both to host concerts in the Monferrato, between Gavi and Novi Ligure, and cultural events, conventions and business meetings. It can host up to 130 people and guarantees perfect acoustics. The events organized at the concert hall are embellished by the unique context offered by the historic house. Adjacent to the villa historic house, The Orangery (the Italian “Limonaia”), of about 200 square meters, is a typical element of the great country properties, essential to keep, during the cold winters of the area, the lemons that until 1800 were precious for the cure of many diseases. La Limonaia preserves the volumes of the period intact and is available as a venue for events and charming weddings in Italy for up to 130 people. 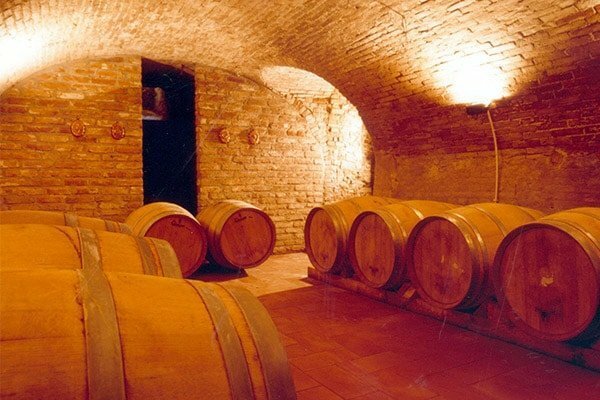 Located in the basement of the villa, the old cellar is not normally open to visitors, but bears witness to the long winemaking tradition of the estate. The estate is managed, on the model of the most prestigious bordeaux chateaux, as an immense garden marked by the Italian garden in front of the villa, from the orchard garden organized in perfect rows bordered by cypress trees, from the water garden near the lake of almost two hectares embellished with lotus flowers. 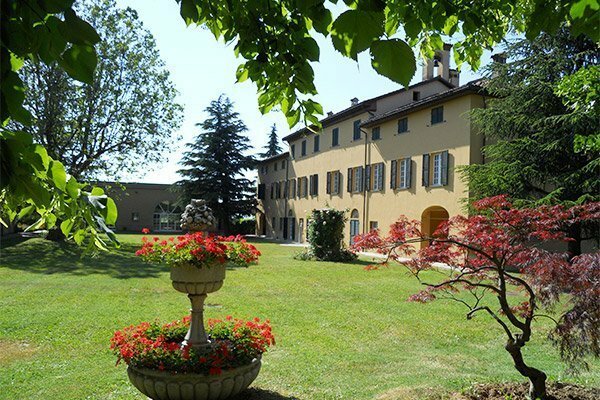 The palms, the chestnut trees in the woods and the vineyards, design the landscape-garden, open to the view on the hills of Monferrato up to the snow-covered Alps. The orchard garden has a collection of fruit trees, with which we produce the jams offered to the farmhouse. 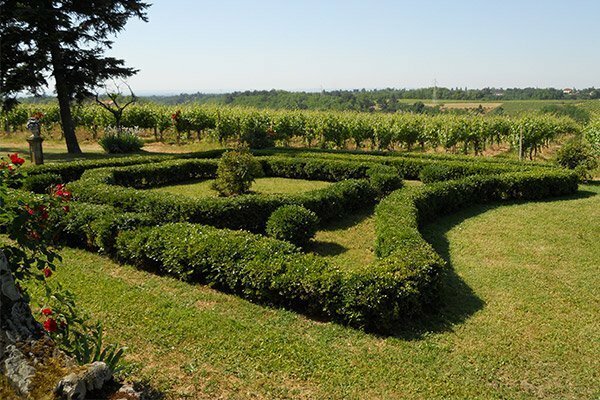 A large garden of almost half a hectare is destined, together with aromatic plants, to the kitchen of the restaurant: we are proud to respect the traditional cuisine and to ensure that 85% of the products offered come from the farm or from the farms of the Region. The Marchesa woods extend around the vineyards and the lake. 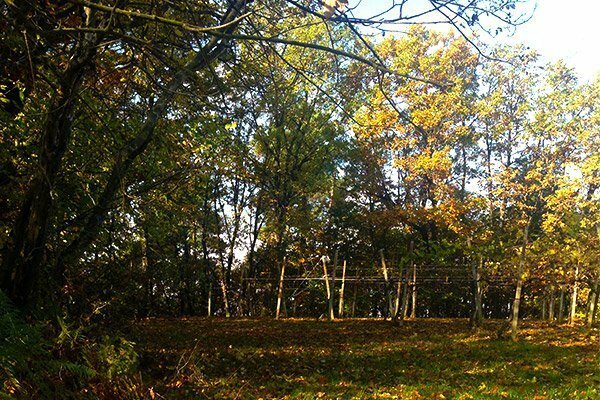 These are the classic Apennine woods consisting of chestnut, oak and a thick undergrowth. The farm is a hunting reserve so it often happens to meet roe, pheasants and hares. About one kilometer from the farmhouse, in the middle of a wood, there is the Marchesa lake, which extends for almost 2 hectares. In May, the lake offers a spectacular flowering of yellow iris; from June to September, of lotus flowers. 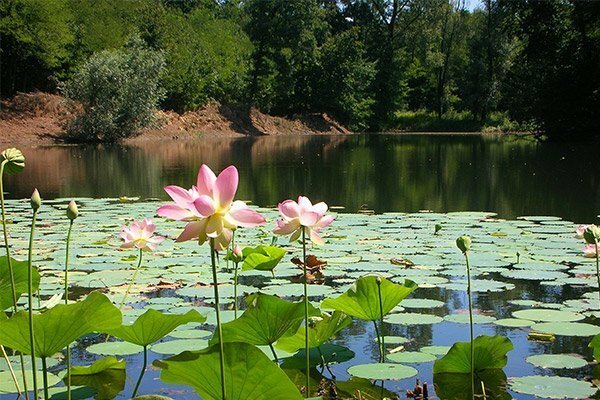 The lake, up to 9 meters deep, is natural and is fed by an underground spring at its center, which is why it is a perfect example of environmental sustainability. From the farmhouse, a pleasant walk of about 20/30 minutes, allows you to appreciate the cool of the woods and water during the summer walking from one side of the lake to the other. The lake is rich in fish (freshwater fish have many thorns!). Fishing is allowed only for guests of the farmhouse. Himalayan palms, the Trachicarpus Fortunei, recall the great fashion of these plants in the gardens of the 1800s and early 1900s. 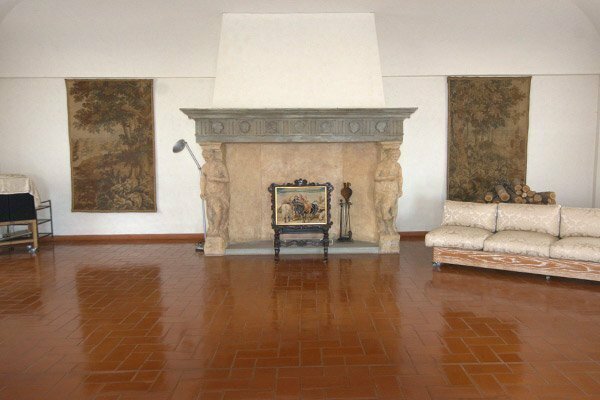 The Marchesa Estate is a member of the Association of Italian Historic Houses (ADSI) and is listed on the website of the Association: Italian Historic Houses. Tenuta di Pietra Porzia in Frascati (Rome) is owned by the same family.